← Healthy Shabu-shabu: Food wins, kaoko fails. I have a fondness for kara-age, Japan’s take on fried chicken. Why not? It’s crisp, very juicy and it’s easy to eat since they’re usually served as large meaty chunks, sans bones. Marinated in soy sauce and ginger, it has a delectable juiciness that’s loaded with natural chicken goodness. I love how this recipe turned out because the chicken remained moist and juicy. I hear ginger is used as a meat tenderizer; maybe that’s how it retained the moistness? It wasn’t as crispy as when it was freshly fried but it was still good and offered a crusty bite against the tender meatiness of the insides. To go with the chicken, I hardboiled an egg then popped it into an egg mold, just for the cute factor. Cute is instant plus, I’m sure you guys would agree. To complete the meal, I added mini carrot sticks and some shredded nori to fill the gap. Everything’s resting on a bed of rice, turning it into a complete, hearty meal. 1. Mix the soy sauce, sake and ginger. 2. Rub the mix on the chicken, then marinate for at least 30 minutes. 3. Heat oil for deep frying. When the oil’s hot enough, lightly roll the chicken in cornstarch then fry until golden brown. oh god, i just had dinner but now im hungry again!!! Have you tried Kara-udon/soba from Komoro-Soba at MegaMall? I highly recommend it. 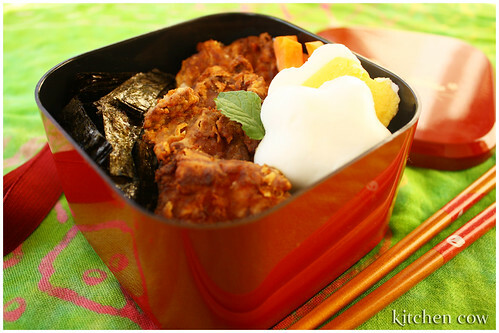 that’s the cutest bento box kaoko, where did you get it? I have actually been trying to find a recipe for kara-age. Thanks! I’ll have to try that out. are those star-shaped eggs?!?!?!?!?! they’re cute! Nopes, it’s too far from me. From one of those 88 peso shelves in supermarkets. I think I got this one from Makati Supermarket Alabang. Although it’s been quite a while back, I don’t know if they ever restocked. Very tender way to fry, I like how it stayed juicy and all. wee! another bento. makes me feel hungry. hi… uhm would it matter if i skip on adding sake? If it can’t be skipped, where could i get one? Hi alex! I wouldn’t really recommend skipping the sake because it’s an integral part of the recipe. It gives a distinct flavor and aroma to the whole thing. It’s not too expensive to buy anyway and is a staple for Japanese food. Check out your local Japanese / Asian grocery for cooking sake, not to be confused with Mirin though, which is like a sweeter version of cooking sake. how do you think it would turn out if i used soju (korean) instead of sake? 😛 and also do you know how to make the sauce for this like the one from tokyo tokyo? kinda like thin and sweet gravy… thanks! !